Many Americans have family members who have immigrated from one of the 27 countries that make up the European Union (EU) and may be eligible for an EU passport. The EU's individual member nations issue their own passports, and each country has different requirements. To learn about country-specific requirements, you will need to contact that country's consulate. Many EU countries have a few eligibility requirements in common. Jus Sanguinis means "law of blood," and refers to laws in most EU member nations that provide citizenship to anyone who has parents that are citizens of that particular country. In some countries, like Ireland and Germany, having native-born grandparents may also make you eligible for citizenship. You will need documentation to prove your heritage, including family birth and death certificates (if applicable) and your birth certificate. Jus Soli means "law of the soil," and pertains to people born in an EU country even if their parents are not citizens of that country. Again, you will need documentation proving your birthplace. This law usually does not apply to children born on U.S. military bases abroad. On its website, the U.S. State Department says children born on foreign soil to American parents can be dual citizens of both the United States and their country of birth. 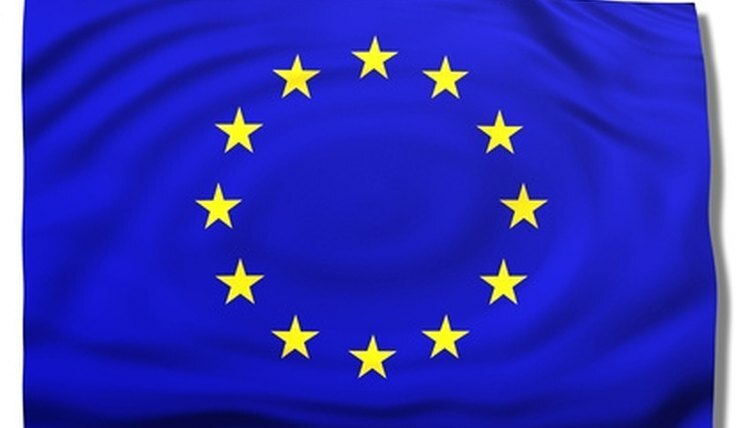 If you marry a citizen of an EU member state, you may be eligible for citizenship in that country. You will need to provide proof of the marriage, and may need to live in the country for a designated period before you can apply for citizenship. The U.S. State Department says people who are automatically granted citizenship in another country will not lose their U.S. citizenship, but someone who applies for foreign citizenship voluntarily may forfeit their U.S. citizenship. U.S. citizens may choose to immigrate to an EU nation. If you do so, you will need extensive personal documentation such as your birth certificate, education records, medical records and financial records. You may also need to hire an immigration attorney to assist your efforts. Immigrating to an EU nation means giving up your U.S. passport and your rights as an American citizen. Skubal, Nicole. "EU Passport Requirements." , https://legalbeagle.com/6331252-eu-passport-requirements.html. Accessed 23 April 2019. Does Trinidad Have Dual Citizenship With the U.S.?